John Titor!? Metal OOPA!? Light's seiyuu!? TU-TU-RUU!?!? 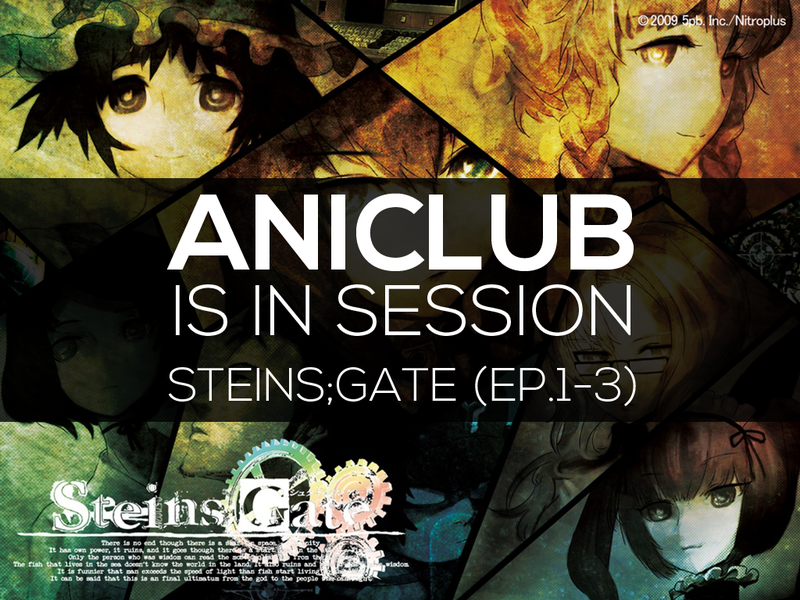 Welcome to the AniClub's first meeting for Steins;Gate! I hope you've all watched the first three episodes. If not, feel free to comment even long after this has been posted. I'll be posting a few guidelines below and proceed to the meat of the discussion. Right from the beginning we are sent off to a running start. Mysterious moans, gel bananas, TIME TRAVEL IN THE FIRST EPISODE!? It seems like this anime doesn't waste time. I've watched the series before so I'll avoid discussing much of the plot here to avoid spoilers. I will rave about the characterizations, though! Okarin is instantly lovable with his chuunibyou-ish personality. He's also voiced by Light's seiyuu, Mamoru Miyano who also voiced Tamaki from Ouran High School Host Club which was the first AniClub series. Daru and his perverse jokes are also welcome additions to the crew. Daru with any of the other female characters is always a nice combination. Wet floppy bananas for the win. Kurisu...Kurisu is love. She's my all-time favorite female character and the center of much of the series' mysteries. And who could forget Mayushi? The scene introducing Ruka is also pure gold. That's it for now from me so I could avoid sharing spoilers unintentionally. Please feel free to discuss and share GIFs, pics, wallpapers anything and everything. How do you feel about the first three episodes? Excited? Bored? Already figured it out? Whatever it is, I hope to see you in the comments section! EDIT: FORGOT ABOUT THE BEST CAST MEMBER. ALPACA MAN. Please don't forget to watch the next three episodes of Steins;Gate (4-6) for next week's meeting. Starting next week, AniClub will be posted on Wednesdays at roughly the same time. Hope to see you there again! For all your other chuunibyou delusions, visit TAYClassic or the TAY IRC. ps. I forgot to post a reminder yesterday -.- Will post reminders a day or two before AniClub next week so people will remember to watch the episodes.